Abarca-Olivas, J (1); Verdú-Martínez, I (2); Bartschi, P (1); González-López, P (1); Moreno-López, P (1); Lloret-García, J (1,2). (2) Department of Histology and Anatomy , Universidad MIguel Hernández, San Juan, Alicante (Spain). The brain ventricles are anatomical interconnected cavities where the cerebral spinal fluid flows through. The cerebral ventricular system is composed by the four well known cavities: the two lateral ventricles, the third ventricle and the fourth ventricle. Each lateral ventricle communicates with the third ventricle through the foramen of Monro and the third ventricle communicates with the fourth through the Silvian acqueduct. The lateral ventricles and third ventricle approach are particularly difficult because they are deeply located, because they are completely surrounded by nervous tissue (among which the motor and sensory areas, the visual pathway…), because of their curved shape, because of their wide variety in size among individuals and because the tiny foramen through which they connect with each other are prone to obstruction. The lateral ventricles and the third ventricle are in close relationship with a complex arterial irrigation system and particularly with a deep venous system draining through the complex Galenic system. In this picture we can see that the transition from the lateral ventricle to the third ventricle contains both internal cerebral veins. The ventricular system relationship with the surrounding nervous structures will determinate the capacity to approach the cerebral lesions as well as to explain neurological deficits produced by excessive dilation in hydrocephalus or by primary growing masses or by secondary invasion. CC: Corpus callosum; CH: Chiasma; CN: caudate nucleus; F: fornix; M: midbrain; T: Thalamus. -The body (blue shade): from the foramen of Monro up to the point where the septum pellucidum ends and the union point of the corpus callosum and the fornix . -The temporal horn (green shade) : a projection to the temporal lobe. In this axial view we see the lateral ventricle part anterior to the foramen of Monoro. Boundaries on this sagittal oblique view. The lateral wall is determined by the head of the caudate nucleus. The anterior wall is determined by the genu of corpus callosum. The floor is determined by the rostrum of the corpus callosum. Saggital view of the lateral ventricle. On the medial wall we can see that the superior part of septum pellucidum has been removed and we se the fornix (F) that lies inferiorly. The lateral wall is composed by the caudate nucleus (CN) lying inside the body of the lateral ventricle. In this coronal picture we see the roof shaped by the corpus callosum (CC). 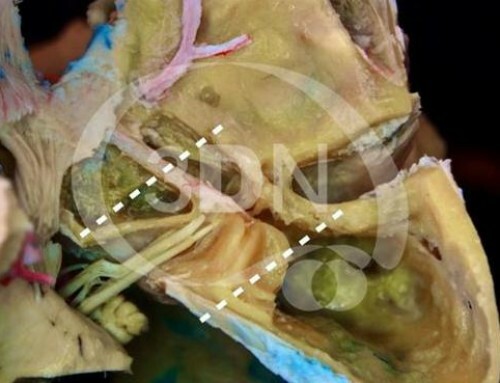 The lateral wall is composed by the head of the caudate nucleus (CN) . The floor from medial to lateral we can see the fornix (F) , the choroid fissure(ChF) (which is the choroid plexus-ChP-fixing point and is a corridor towards the third ventricle. Pay attention to the internal cerebral vein(ICV) ) and finally the thalamus (T). Between the thalamus and the caudate nucleus we have the striatal-thalamic groove (ETS) through which runs the thalamostriate vein. Before describing the endoscopic anatomy of the lateral ventricle body, we should explain the trajectory we have to perform with the endoscope to get through the foramen of Monro and reach the premammillary body region of the third ventricle. 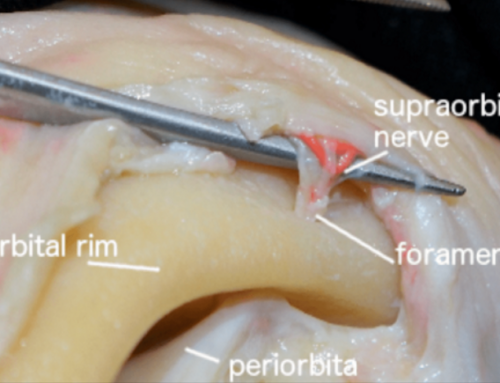 In this anatomical pi.ece where the right hemisphere has been removed and where an osteotomy at the level of the left coronal suture has been performed, we can see the endoscope entry point through the Kotcher’s landmark: 1 cm anterior to the coronal suture and 2 cm lateral to saggital suture. Endoscopic view of the floor of the lateral ventricle body. 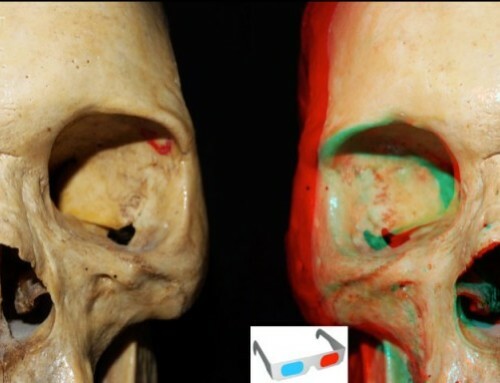 We see the foramen of Monro. Ventricular body endoscopic picture from the foramen of Monro through a 45° optics. The floor from left to right , we have the fornix (F), the choroid plexus (ChP), the thalamus (T), the caudate nucleus (CN) on the right . We can clearly see the stria terminalis (ST) on the upper right. The roof is determined by the corpus callosum (CC). The anatomical landmark to locate the ventricular atrium from the cerebral surface is the transverse gyrus . 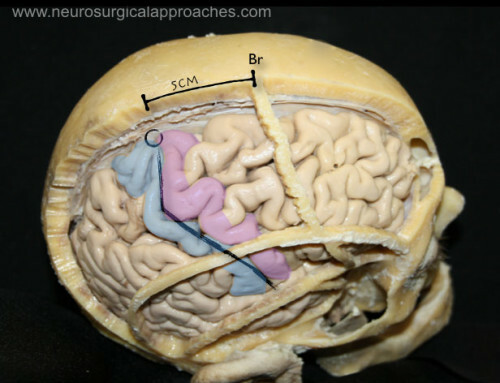 We know that the transverse gyrus is guiding us directly to the ventricular atrium (A), which is exposed in this picture after a brain slice has been dissected. On the medial wall: superiorly lies the forceps major (FM) of the corpus callosum (CC) and inferiorly we can see the “the calcar avis” (CA) which is an intraventricular projection of the calcarine fissure . The floor is formed by the collateral trigone (CT), which is an intraventricular projection of the collateral sulcus. In this picture the choroid plexus is elevated and we can see again the “calcar avis” (CA) on the medial inferior part . On the floor ( on a forward projection towards the temporal horn as a collateral eminence (CE)) the collateral trigone (CT) and on the anterior atrial wall we can distinguish the hippocampal tail (HT). In the upper left corner picture , the collateral sulcus pathway is clearly visible (red discontinued line) splitting the parahippocampal gyrus from the fusiforme gyrus. The roof is determined by the splenium (S) and laterally by the tapetum (T) of the corpus callosum. The superior medial wall is determined by the forceps major (FM) of the copus callosum. The inferior medial wall is determined by the calcar avis (CA), look at the calcarine fissure projection (CIS). The floor is made of the collateral trigone (CT) which is the projection of the collateral sulcus. If we retract medially the choroid plexus (ChP) we can see the choroid fissure (CF). Once the choroid plexus has been removed we see the choroid fissure and the atrium anterior view. We have better view at the opening of the choroid fissure (ChF) between th fornix and the pulvinar. ENDOSCOPIC PICTURE OF THE ATRIUM FROM THE LEFT VENTRICULAR BODY. We can see the choroid plexus pathway towards the temporal horn. We can see on the medial wall the septum pellucidum and calcar avis (CA). The roof is made of the splenium (s) and tapetum (Tm) of the corpus callosum. The choroid plexus (CP) is hiding from us most of the floor , but anteriorly we can sill see on the medial part the hippocampal head (HH), in front the uncal recess (UR) and more in front the amygdala (A). Lateral to the hippocampus we can guess the collateral eminence. The Hippocampus entire length (H). The collateral eminence (CE) , which is the collateral sulcus intraventricular projection. On the floor, medially there is the hippocampus, laterally the collateral eminence (CE) ( look how it projects fro the collateral sulcus) . Le lateral wall and the roof are composed by the tapetum (T) of the corpus callosum, which separtes the temporal horn from the optic radiations (OR). The roof medial part is determined by the tale of the caudate nucleus (CT). The medial wall is determined by the choroid fissure (ChF) with the choroid plexus. We see the anatomy of the lateral ventricle roof: from anterior to posterior : the foramen of Monoro (FM) , medially limited by the fornix columns (FC), at the ventricular body level we can see the choroid plexus (ChP) with the superior choroid vein (CV) , laterally to the choroid plexus we have the thalamus (T). From the posterior part of the foramen of Monro we can see the septal vein medially and the thalamostriate (TSV) vein laterally. -And again the Tela choroidea. Way at the bottom we can guess the tela choroidea. If we push aside medially the fornix , we can see the internal cerebral vein (ICV) on the same side, from which arise he septal vein and the talamostriate vein (TSV). In this picture we can see both of the internal cerebral veins (ICV) on the roof of the third vetricle. Here we can see, after the removal of the splenium and retraction of the crus of the fornix , the entry of the internal cerebral veins (ICV) into the Galenic vein (GV) at the pineal region. The lateral wall is formed by the hypothalamus (H) inferiorly and the thalamus (T) superiorly . 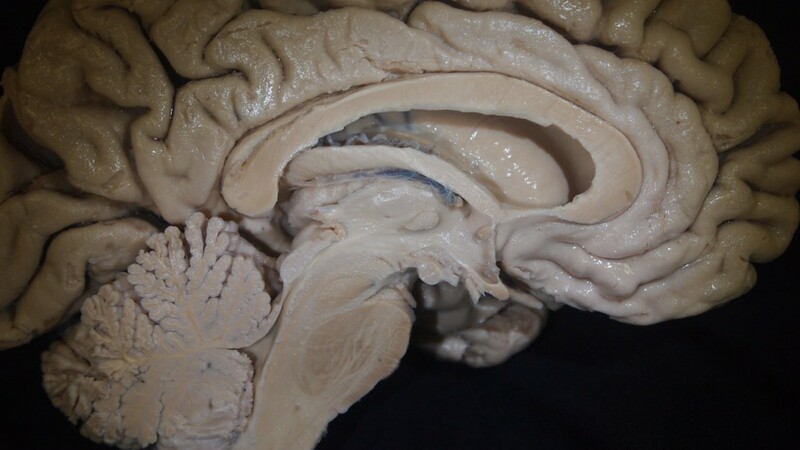 They are separated by the hypothalamic groove, which is a depression that runs from the foramen of Monro to the Sylvian aqueduct (SA) passing below interthalamic mass (IM). In a saggital cut at the hypothalamic level two recesses are exposed : The optic recess (OR) upward and the infundibular recess(IR) below. Look also at the superior thalamic limit , we can see the thalamic stria mediullaris (SMT) that goes from the Habenula (Hb) to the foramen of Monoro , and this is the fixing line of the tela choroidea inferior of the velum interpositum. The interthalamic mass are association fibers that connect both thalamus and is present in 75% of the population. 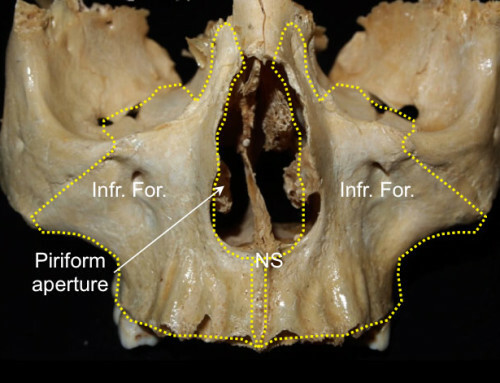 The foramen of Monro is surrounded laterally by the columns of the fornix (FC) that will follow a trajectory towards the mammilary bodies (MB). The anterior commisure (AC) are association fibers located in front of the columns of the fornix. The lamina terminalis (LT) which is a thin layer of pia matter and gray matter that goes from the rostrum (RC) of the corpus callosum to the optic chiasma (Ch) in front of the anterior commissure. The lamina terminalis (LT) is visible in an anterior view unlike the fornix and the foramen of Monro. Finally the optic recess (OR) that projects to the optic chiasma. From anterior to posterior : The optic chiasma (Ch) , The infundibulum (I), the tuber cinereum (TC) , the mammillary bodies , the posterior perforated substance (PPS) , the medial pairs of the cerebral peduncles (CP). As we can see , the optic chiasma and the optic tracts are used as the lateral limit of the third ventricle floor. In this saggital cut we differentiate two halves: the anterior diencephalic half and the posterior mesencephalic half. Endosopic picture of the third ventricle floor: from anterior to posterior we see the optic recess(OR), theinfundibular recess(IR) , the tuber cinereum (CT), the mammillary bodies (MB). The habenular commissure (Hb) are formed by fibers that connect both habenular nucleus on both side of the mid line. The habenular nuclei receive afferent input from the hypocampus and amygdalian nuclei through the thalamic stria medullaris (SMT). The posterior commissure (PC): just on top of the the Sylvian aqueduct (SA) carrying oculomoro reflex related fibers. Superior view of the posterior part of the third ventricle floor. A callosotomy of the body and the splenium has been performed. The velum interpositum has been breached and then we separate both of the internal cerebral veins (ICV). We see the Sylvian aqueduct (SA) below the posterior commissure (PC). We have a clear look at the pineal Gland (P) . The habenular commissure has also been seccionated. Timurkaynak E, Rhoton AL Jr, Barry M: Microsurgical anatomy and operative approaches to the lateral ventricles. Neurosurgery 19:685–723, 1986. Wen HT, Rhoton AL Jr, de Oliveira EP: Transchoroidal approach to the third ventricle: An anatomic study of the choroidal fissure and its clinical application. Neurosurgery 42:1205–1219, 1998.